The Conference will take place in the scenic city of Sozopol on the Black Sea Coast, Bulgaria, Sozopol is the home of numerous high-quality resorts with very reasonable prices (usually of the order of 50-60 euro per night). The city itself offers an array of dining and entertainment places, not to mention the cozy sand beaches. The place is relatively small and anybody may find it convenient to look for an accommodation in any of the hotels. The walking distance from any point to another point would not probably exceed 10-15 minutes. We contracted the three-star "VIP Zone" to be the hosting hotel where the sessions, coffee breaks, and welcome party will be held. The hotel management offers preferential accommodation prices for the conference participants: single studio - 28 euro per night; double studio - 35 euro per night; maisonette - 65 euro per night. More of the participants and accompanying persons will be accommodated there. For booking rooms there or in neighbor hotels and villas please contact the hotel "VIP Zone" management at http://www.vipzone-sozopol.eu/. They will confirm your accommodation. You should do that by April 30rd at latest. You are kindly asked make sure that you identify yourselves as registered participants of the 2nd AMiTaNS'10 conference. We recommend those of you who intend to accommodate in other hotels or private rooms to contact travel and touristic agencies to provide reservations. 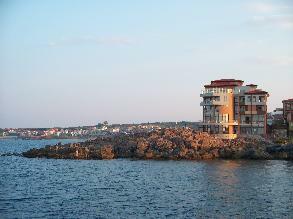 Sozopol's sea in the night Hotel "VIP Zone" as seen from the sea. The regular flights of the Bulgaria Air are every day from Sofia to Varna and Bourgas. There are many charter flights from Europe to both Varna and Bourgas. The travel from the Airport of Bourgas via the town of Bourgas to Sozopol (about 45 km) can be done by using of regular public transportation between 7 am and 10 pm and only by taxi in the rest part of day. For those who intend to fly to Sofia there are also some buses and trains every day from Sofia to Bourgas and direct bus line from Sofia to Sozopol (about 400 km). A regular night direct bus line from Sofia to Sozopol in the beginning of June is expected as well. The travel is about 7 hours. The distance between the Airport of Sofia to the Central Bus Station of Sofia is about 15 km and the transfer is realized by taxi (about 10 EUR fee). There is a convenient daily bus connection from the Central Bus Station in Istanbul (Turkey) to Bourgas and vice versa. The travel is about 6 hours.